Two years of work. Perhaps as much as 130 pages once he’s finished writing. And only three minutes to present his entire master’s thesis in a way that’s comprehensible and entertaining to lay people, with the help of just one PowerPoint slide. 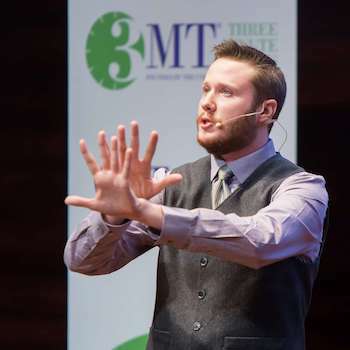 That was Wilfrid Laurier University graduate student Richard Edwards’ challenge in the Three-Minute Thesis (3MT) competition. And he succeeded so admirably, he’s now in the nationals. Edwards, a second-year master’s student in chemistry, won the Laurier competition in March and was first runner-up at the provincials in April. Now he is one of the top 11 nationwide – and you could help him win. Since there is no live national competition, the video of Edwards performing at the provincial competition is being featured along with those of the 10 other finalists on both YouTube and the Canadian Association for Graduate Studies website. Prizes will be awarded for the judges’ top two choices and a people’s choice winner, determined by online voting from May 12 to 26. To vote, click the "vote" button beside Edwards' video on the finalists page, then click the green "Vote for People's Choice Award" button near the top of the page. The 3MT competition for graduate students was founded by Australia’s University of Queensland in 2008 and quickly caught on around the globe. A competition has been held annually at Laurier since 2013. Edwards decided to take part to improve his ability to present to a general audience. Edwards, who admits to a competitive streak, analyzed the videos of winners from previous years and noticed a surprising pattern. Edwards wrote down and revised his talk extensively to make sure he got the exact wording right – every word and dramatic pause counts when you only have 180 seconds. Then he practiced in front of his roommates and girlfriend. A lot. “You have to memorize it. If you go up there and try to wing it with rough points, you won’t make it because the time limit is too strict,” he says. In his presentation, Edwards starts by talking about the Black Death in the Middle Ages. It has nothing to do with his research, really – the point is to draw in the audience by making the point that something as tiny as bacteria can have a huge impact. Edwards works with something much tinier – quantum dots, the common name for semiconductor nanocrystals. They have the ability to emit specific colours of light and can be mirror images of each other – chiral, in chemistry parlance. Edwards’ research focuses on determining the existence of intrinsically chiral quantum dots – he says they do appear to exist – and the mechanisms needed to create them. It’s a step along the way to being able to use quantum dots to identify tumours in the human body. Because cells have chiral components, some of which are unique to cancer cells, a quantum dot could potentially be fitted to a cancer cell, lighting it up. This could help doctors identify tumours, possibly even allowing surgeons to visually see cancerous cells during surgery – helpful because the edges of tumours are often ill-defined. Practical medical application is a long way away. Edwards’ research focuses on modelling quantum dots on supercomputers, so it would have to be proven in the lab before it ever gets to the operating room table. “Could be a PhD for me; who knows?” says Edwards of synthesizing chiral quantum dots in a lab. Edwards expects to finish his master’s this summer. His long-term goal is to be involved in metamaterials design in some capacity, whether in industry or academia. Metamaterials, such as quantum dots, are synthetic materials engineered to have properties not normally found in nature. One challenge associated with quantum dots is that there needs to be a way to protect them from breaking down – as well as to protect the patient from the quantum dots, which are made using toxic heavy metals. Edwards’ research takes this into account theoretically by using small ligands, which are molecules that can bind to quantum dots, enclosing them. However, larger ones would be used in reality, so this must also be proven in a lab.